GDP shrank at a 0.1 percent annual rate in the 4th quarter of 2012, according to BEA numbers released today. While that sounds like we’re half way to a recession, it more likely points to continued slow growth in 2013. The good news is that business (nonresidential fixed) investment grew 8.4 percent, after falling 1.8 percent in the 3rd quarter. And the housing market is definitely on the mend, with residential fixed investment increasing 15.3 percent, following a 13.5 percent increase in the 3rd quarter. Consumers basically hung in there, with expenditures growing at about the rate of the overall economy. The biggest drag on GDP was defense spending, which fell at a 22 percent annual rate. This brought defense spending back to where it was in mid-2009. Unless the upcoming budget deals roll defense spending further back, we are unlikely to see another recession this year. That is not to say that a sound economy comes from propping up the defense industry, as many contend. Nor does it come from getting consumers to spend like mad, as so many Keynesians will tell you. These are ways to boost GDP in the short run, as in this quarter, but long run growth depends on investment. 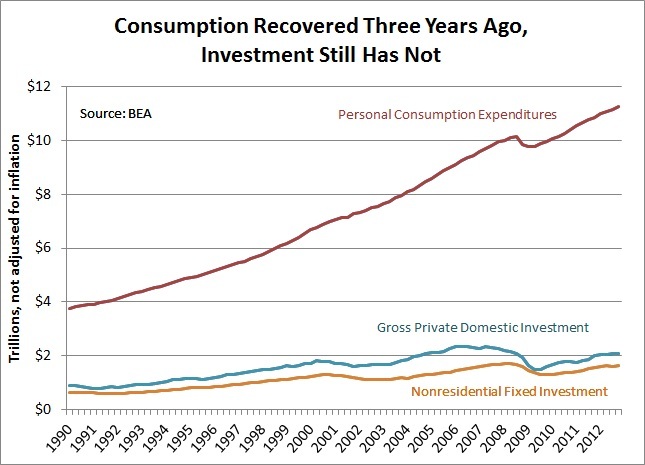 And while investment is improving, it is climbing only slowly out of a very deep hole. The chart below shows that investment has yet to fully recover from the recession, in nominal terms, much less in real terms. Gross domestic investment has been increasing since it bottomed out in the 3rd quarter of 2009, but it remains about $270 billion below its peak in the 2nd quarter of 2006. Much of this is the historic housing slump, but even nonresidential investment remains about $45 billion below its peak in the 1st quarter of 2008. Worse, investment growth slowed in 2012 and seems unlikely to achieve a new nominal high in 2013. That would be the longest and slowest investment recovery since the Great Depression, in both real and nominal terms. Meanwhile, consumption recovered to its pre-recession high three years ago – in the 1st quarter of 2010. This was prior to the payroll tax holiday of 2011, which was pitched as a demand-side stimulus. The fact is consumption just doesn’t change that much, even with the dramatic set of temporary stimulus measures thrown at it in recent years. This is because consumers do not view these temporary changes in income as permanent, because they are not. This is Milton Friedman’s Permanent Income Hypothesis. Investors, on the other hand, just got a permanent tax increase, in the form of higher shareholder taxes and higher marginal tax rates for high-income earners, who tend to be investors. Unless there is some rolling back of these taxes, and/or a lowering of corporate taxes, we can expect the investment slump to continue and economic growth to disappoint.